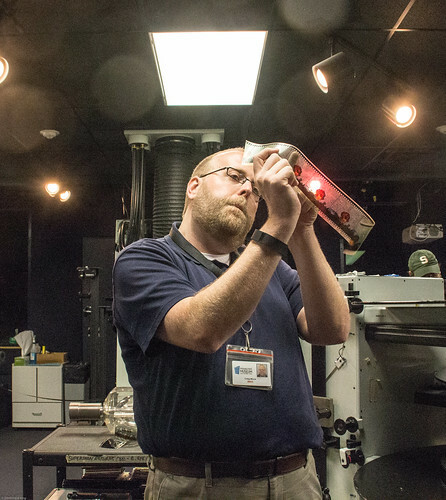 Getting a backstage tour of the IMAX Movie Theater at the Indiana State Museum felt like sneaking a peek behind a curtain and spotting the Wizard working to create a wonderful illusion. Immersing yourself in a voyage to the bottom of the sea, a tour of our nation's National Parks or a concert experience starring a favorite musical group can be a quick getaway from the stresses of everyday life, even as the technology of sound and image transmission constantly evolves and moves to more compact digital mechanics. I never gave much thought to the mechanics of the IMAX experience, but always enjoyed the larger-than-life images and surround sound systems at those theaters (We've seen IMAX shows several times at The Henry Ford's theater here in metro Detroit and especially enjoyed concert films from U2 and The Rolling Stones). We toured behind the IMAX scene at the Indiana theater before taking our seats in the museum's 404-seat IMAX amphitheater before to enjoy watching a movie on the theater's six-story-tall screen. 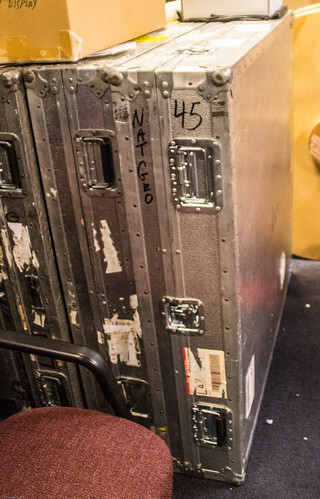 Here are a few things we saw during our behind-the-scenes tour. Film sits on platters and runs horizontally through the IMAX projector to allow for the use of larger film (65mm or larger, as opposed to smaller conventional sizes like 8mm, 16mm or the 35mm size many of us may remember from older, conventional cameras or projectors that hold the film vertically). 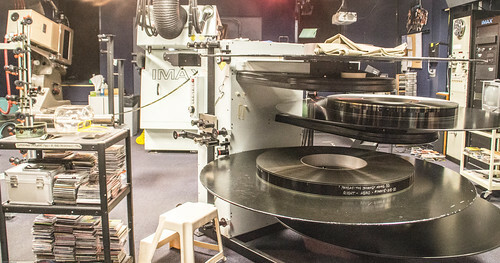 IMAX film platters range from approximately 4 to 6 feet in diameter to accommodate one to two-and-three-quarter hours of film. Platters holding a two-and-a-half hour feature film weigh about 550 pounds! Figures from January 2016 show there are over 1060 IMAX theaters in 67 countries. The IMAX theater in the Indiana State Museum has the state's largest theater screen. Because the IMAX equipment and film take up so much storage space, older versions of the system are quickly evolving into newer digital or laser systems. I expect that the next time I'm fortunate enough to take a backstage IMAX tour, I'll see newer technology and film that is more compact and easily manageable than today's technology. Check out the Web site of IMAX theater at the Indiana State Museum to see the latest shows scheduled at the theater.